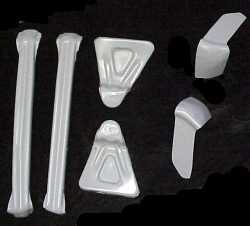 Over 100 parts for 55, 56, 57 Chevy ! 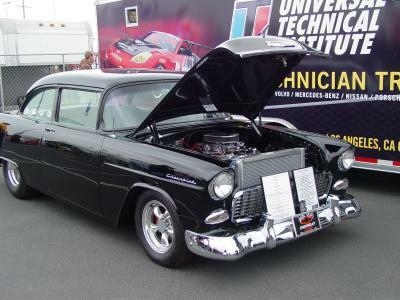 55 Front and Rear Bumper in Real/Carbon and for the carbon "Look"
For the "Best" in top quality, best fit, chose "Unlimited"
Parts for the 1955 Chevy is a Standard at Unlimited! 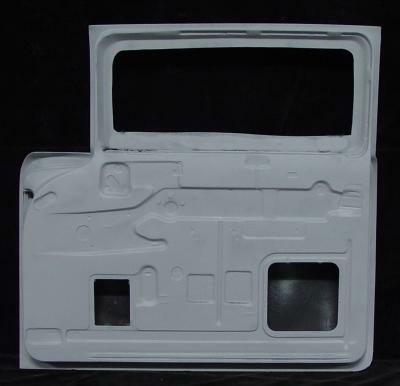 Our molds/tooling for these doors are brand new and produce "Beautiful" parts. These doors accept roll up windows. We have instructions and help available for this installation, please ask. 55-130 1955 Chevy One piece "wrap around" front end. Consists of fenders and front grill area...all one piece. No hood. Bumper built in. Head light area has outline for cutting-in original head lights. 1955 Chevy One piece front end. Consists of fenders, front grill area and hood...all one piece. With bumper built in. 55-512R&L 1955, 56 ,57 Sedan Chevy doors, complete with inner structure. Also: 1956 Chevy doors, 1957 Chevy doors. 2 door post model only. 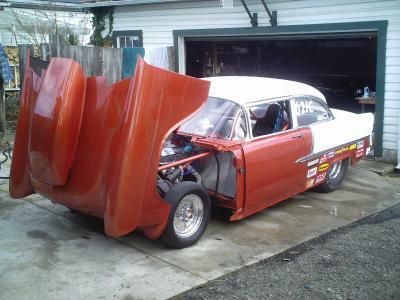 1955, 56, 57 Sedan Chevy doors, Race Weight! complete with inner structure. Also: 1956 Chevy doors, 1957 Chevy doors. 2 door post model only. "Part number for the pair 55-118cc"
P- Pin on only . 55-512R&L 1956 Chevy doors, complete with inner structure. 1955 Chevy doors, 1957 Chevy doors. 2 door post model only. 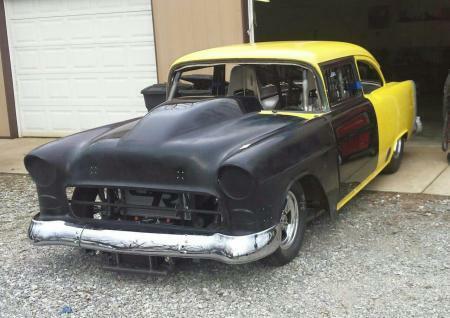 55-588R&L 1956 Chevy doors, Race Weight! complete with inner structure. Also: 1956 Chevy doors, 1957 Chevy doors. 2 door post model only. 55-512R&L 1957 Chevy doors, complete with inner structure. 1956 Chevy doors, 1955 Chevy doors. 2 door post model only. 55-588R&L 1957 Chevy doors, Race Weight! complete with inner structure. Also: 1956 Chevy doors, 1957 Chevy doors. 2 door post model only. UP22.com the web's giant-giant site for quality fiberglass. Customers agree, fit, price, quality all come together at UP22.com. Please visit UP22.com frequently to see updates, specials and new items. Or visit our factory in Hesperia CA. can be viewed by scrolling down or clicking part number above. 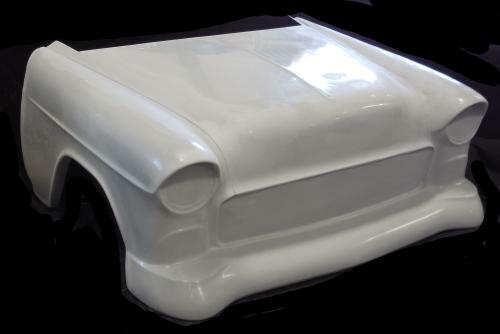 Shoeboxes come alive with low weight fiberglass body components. 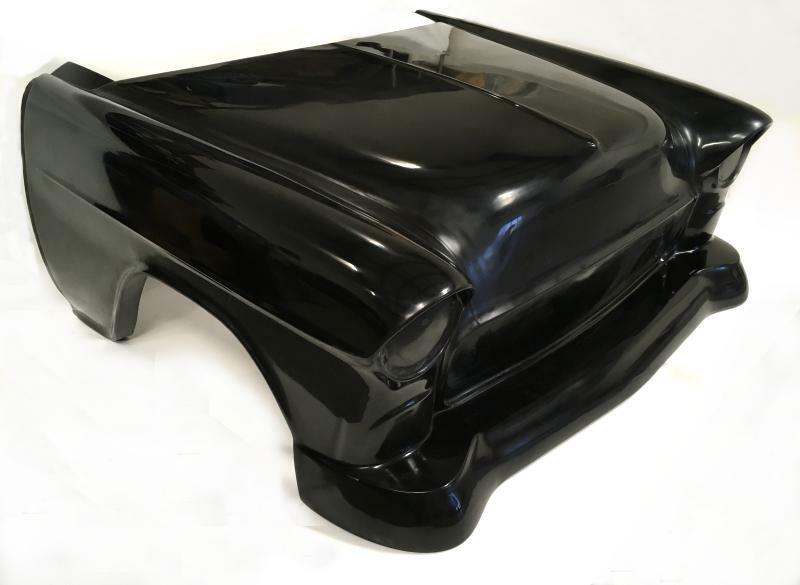 This 1955 Chevy front end has been fully re-tooled and of our molds for all 1955 Chevy parts insure that you will receive the best available design and quality. The grill area is closed and can be cut for easy mounting of original grill. Front lower "pan" is built in. Rear of fenders near doors have molded edge to insure a perfect fit. 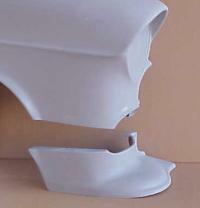 Additional inner bracing is molded into rear section to add support along back edge of the hood. 33 in. high (at rear), 70 in. wide, 59 in. long. 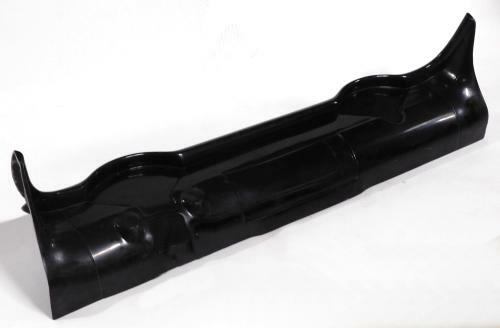 Our one piece front end features full hand laid quality for low weight and durability. All Unlimited's one piece front ends are made double thick for long life. 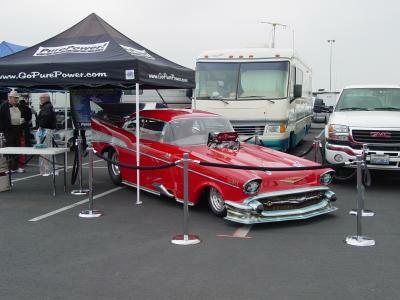 This 1957 Chevy front end is features crack resistant gel coat is a standard feature, headlight areas are blanked off, and can be easily cut out to install original lights. 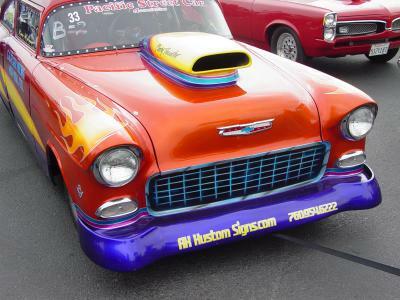 This front end will enhance any "shoebox" street or strip racer. 31 in. high (at rear), 70 in. wide, 63 in. long. Front can be opened up like original if needed.. I got my new scoop yesterday from Unlimited Products. it seems to be decent quality. the only thing I don't like is the front isn't open like they showed in their ad. but it is not a big deal. I like that it has an internal flange for mounting. and the bottom front is fitted to the body line going down the center of the hood, and that body line is faintly applied to the top of the scoop. 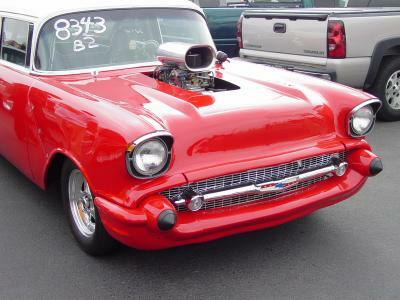 '55 Wrap around front end. NEW! Flange for hood mounting, grill blanked off, bumper built in. Lights can be cut open for installing lights. 55- Front and Rear Bumpers in Carbon with "Carbon Look"
cowl induction scoop. Other sizes available 4-3/4, 6, 7 and 9 inches high. 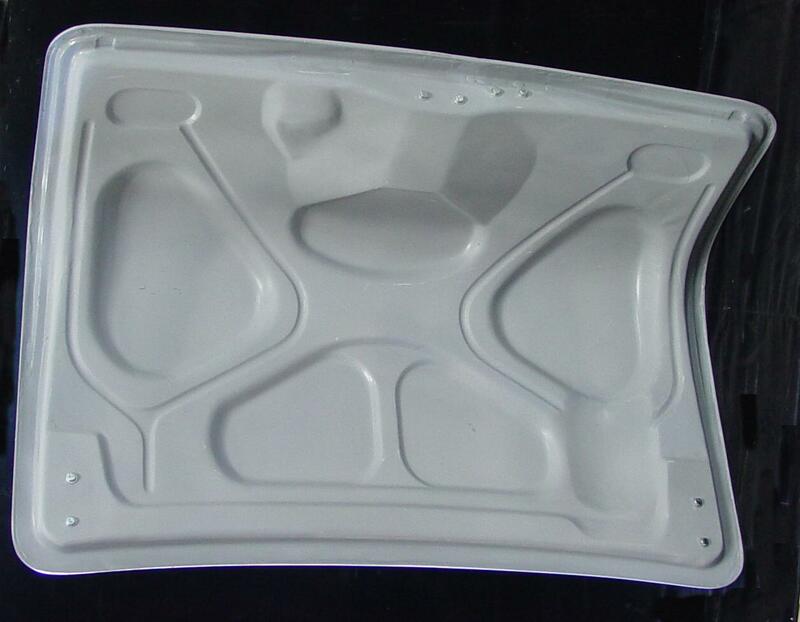 Hood for 1955 Chevy car. 55-501 has steel inserts for mounting to original hinges (springs must be removed). 55-591 has hinge mount provision also, but can use front latch. Underside of both have full bracing for rigidity and support. 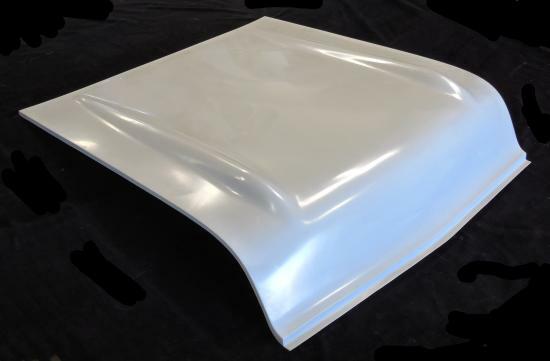 This 1955 Chevy hood features smooth grey gel coat finish, bolts are supplied. All edges are a "molded" finished edge. No sanding or grinding to fit. These molded edges insure a perfect fit, first time. Original chrome "bird" can be installed if desired. Front chrome can also be installed. Weight of 55-501 is 30 lbs. 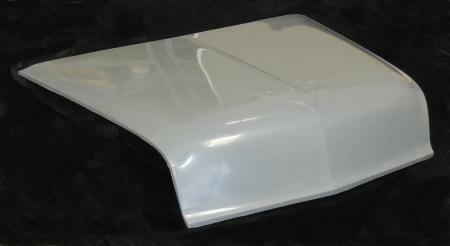 Hood for 1955 Chevy car. 55-585 has steel inserts for mounting to original hinges (springs must be removed). 55-595 has hinge mount provision also, but can use front latch. 55-585T has minimal bracing and is light weight for racing. 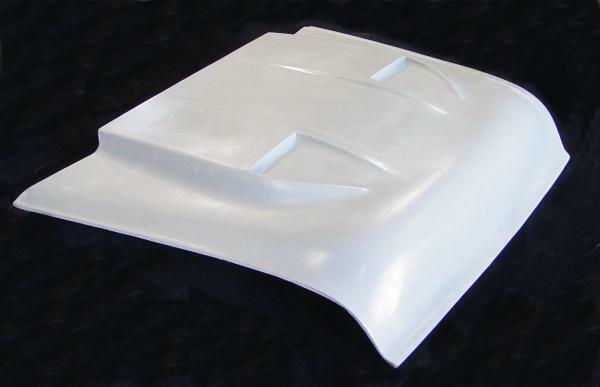 2" high cowl hood with dual NACA ducts. Fits 1955 Chevrolet car. 55-480 bolts to hinges in the rear, pins required in front. 55-490 bolts to hinges and uses front latch. 55-512 for installing original roll up windows. 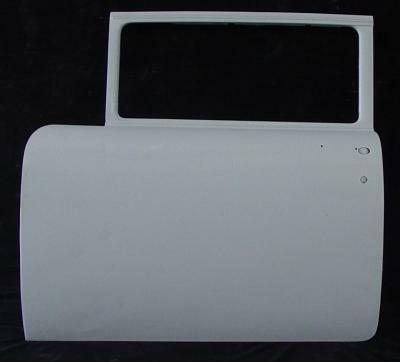 Full fiberglass doors fits 1955 Chevy, 1956 Chevy and 1957 Chevy. Fits 2 door post model only. Has complete inner structure for mounting to hinges, latches, handles and lock button. Stock hinges can be easily bolted to inner molded in hinge mount panel. (Bolts included). This hinge mount panel has small steel inserts molded in and includes bolts (5/16-18) for easy mounting. 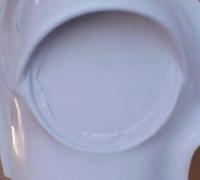 Outer skin has markings to install handles, and locks if needed. Finish is smooth gray gel coat. 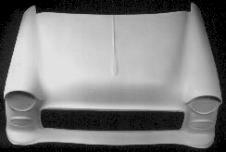 Fiberglass work is 100% hand laid with matting, high strength resin and high strength flat weave cloth. Edges are fully rolled to insure PERFECT fit. Our molds/tooling for these doors are brand new and produce "Beautiful" parts. Molded edges all around for a perfect fit. You will not find better 'glass doors anywhere. 55-588 for installing lexan windows. Race Weight! Full fiberglass doors fits 1955 Chevy, 1956 Chevy and 1957 Chevy. Fits 2 door post model only. Has complete inner structure for pin on race. Lexan windows required. This is the pin on style for race. Outer skin has markings to install handles, and locks if needed. Not designed for street use. Finish is smooth gray gel coat. Fiberglass work is 100% hand laid with matting, high strength resin and high strength flat weave cloth. Edges are fully rolled to insure PERFECT fit. Race Weight doors! 705-55 Low tension hood hinge springs for 1955 Chevy fiberglass hoods. These springs are specially designed for the lower weight of the fiberglass hoods. Original springs will bend and distort a fiberglass hood. 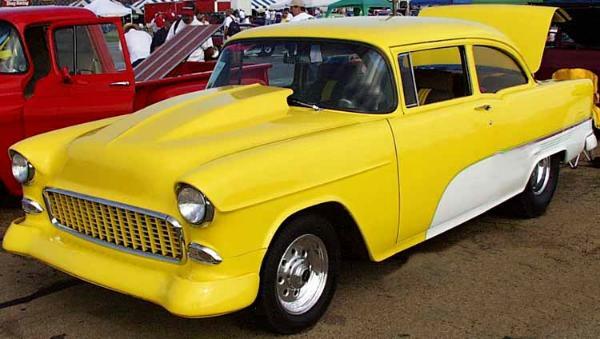 1955 Chevrolet Front Fenders, Rated "Best Quality" by Auto Body Shops! "Perfect straight parts! Perfect fit!" Lower sections (55-503R&L) are not attached, but are easily bolted to lower section of fender (both pieces have matching flanges). Front headlight area can be painted black for racing, headlight decal can be placed here or original headlights can be easily installed. Detail has been retained for easy mounting of all original lights and hardware. 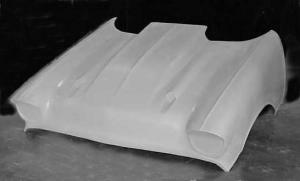 55-503 R&L 1955 Chevy Fender fender filler panels, lower. 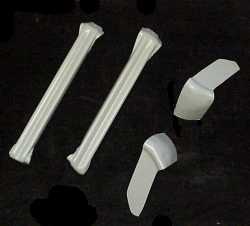 These pieces have complete flange for mounting to original metal fenders or to fiberglass fenders. 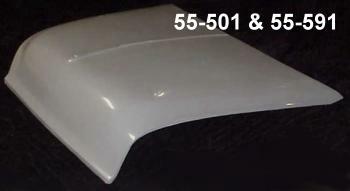 55-502R&L 1955 Chevy fenders. These fenders bolt to original locations. Front lower section is a separate piece and must be purchased separately. Features smooth gel coat finish and made from sturdy hand laid fiberglass. Won't dent, rust or deteriorate in severe weather conditions. Can be used for every day driving as well as drag race application. Rear edge is "molded" for perfect fit to doors. These fenders feature Unlimited's exclusive tooling technique...No dings - no dents - no chips..Very very straight parts! Perfect fit! 55-504 1955 Chevy center filler panel, lower. This piece has a complete flange for mounting to original location. This goes in between 55-503R/L. 1955 Chevy front bumper. Designed for low weight and durability, uprights are fully built in. These 1955 Chevy front bumpers are replicas of the original.They will bolt directly to original brackets. They can be painted black or to match the color of the car. 1957 Chevy front bumper. 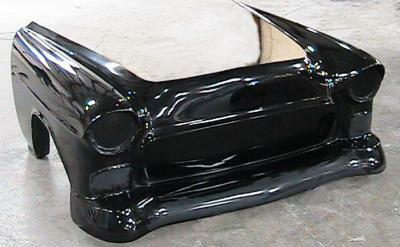 This full fiberglass front bumper replica is a one piece style and has full bullets (less rubber tips) built in. It is very strong and can be painted the color of the car. It will easily bolt to original locations. This is the California-style front bumper. 55-121-6 Front fiberglass bumper brackets. 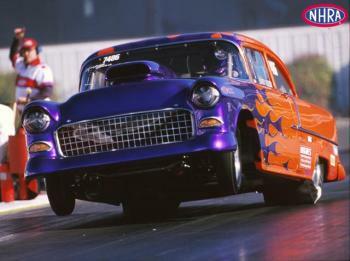 For 55 Chevy. Long braces are 19 in. long. Made of extra thick hand laid fiberglass. 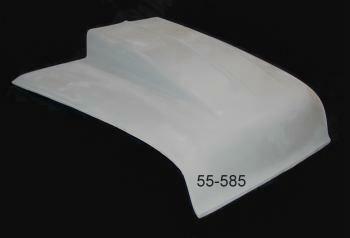 55-122-4 Rear fiberglass bumper brackets. For 55 Chevy. Long braces are 16 in. long. Made of extra thick hand laid fiberglass. 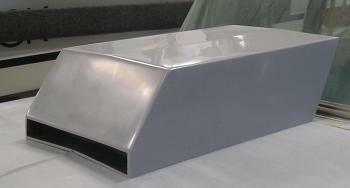 This is a top quality trunk lid and is available with full inner structure for bolting to original hinges. This is part # 55-102H. 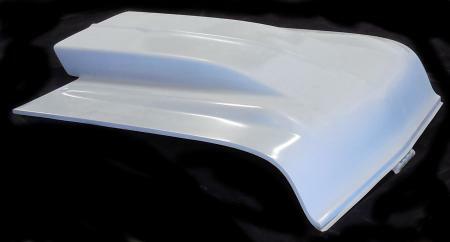 If you are looking for a complete trunk lid, not just the "skin", this is your answer. Fit is perfect! 1955, 1956 and 1957Chevy trunk lid. Part # 55-102T is a full pin on, light weight race version and will reduce your car's weight considerably. It is designed to be pinned or Dzus fastened on, lock is indented like original, but not cut out. All edges are rolled, not rough cut. This assures a perfect fit without trimming or cutting. Back side has minimal reinforcement to reduce weight. 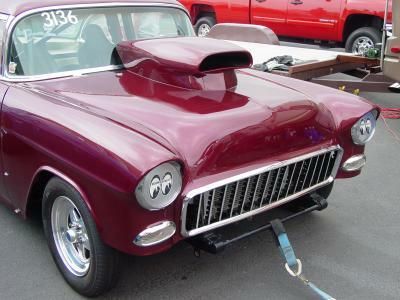 One Piece front end for 57Chev with 3-1/2" high cowl induction scoop. Underside is open for clearance. Features full underside bracing for attaching to hinges and use front latch. 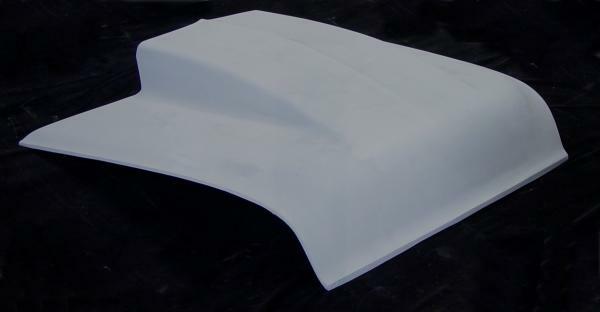 Standard flat hood for 1957 Chevy. Front latch style hoods have provision for latching the front down just like the original. Front latching hoods cost more because they have extra steel reinforcements made into them. The other style (pin down) uses racing type hood pins to hold down the front. These cannot be converted to a latching style. You must drill holes in the front area of the hood for the pins, the pins attach to the radiator core support. Both styles (latching and pin type) bolt to the original hinges in the rear. Bolts are included. Hood hinge springs must be removed and replaced with our low tension springs or a prop rod.